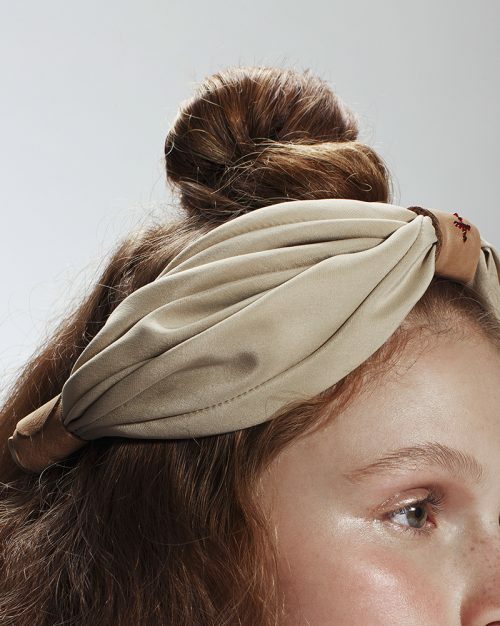 A silk turban styled headband in a camel skin-tone. Effortlessly pleated and gathered in the center with a leather made band-aid. the leather center is embellished with ruby red Swarovski crystals. Leather band-aid wrap details are also placed on each side of the piece. Built as a headband, so that it is open in the back and doesn’t cramp your hairstyle. An ‘easy to wear’ piece that will amp up any casual outfit.